Everyone is pointing fingers in the wake of the murder of 43 students, but who's to blame? From openDemocracy. The transition to democracy in Mexico appears to have mutated towards a transition to a Hobbesian state of nature, where life is short, nasty, and brutal. The most recent example–the disappearance of 43 students from the Ayotzinapa Normal School in the city of Iguala in Guerrero on 26 September–triggered an international media and social outcry against insecurity, violence and lawlessness. But as a recent editorial in the New York Times explained, the unfortunate fate of these students is just another example of a sombre statistic: at least 120,000 people have been killed or ‘disappeared’ in Mexico since the beginning of the ‘war on drugs’ in 2006. This case has only made evident once again how widespread violence has become, how disposable life appears to be and, most shockingly, how unable the Mexican federal government is to uphold the rule of law. Similar to the emergence of the 2011 victims’ rights movement led by Javier Sicilia, a senseless tragedy has once again united Mexicans. Fed up and tired of the rise in violence and insecurity, thousands have joined the students’ families to demand justice and peace. Over the intervening months, students and teachers have organised several paros (strikes) in their universities, and thousands of citizens have issued demands for justice through protests in cities all over the country and beyond. But where does responsibility lie? The question of blame has polarised Mexican public opinion. Some, including the administration of the president, Enrique Peña Nieto, argue that the problem is at the local level and those responsible are confined to the material authors of the crime: the gang members and the local corrupt state agents involved in the atrocity. More than 70 individuals have been arrested, including the local mayor and his wife, and various state officials have been forced to resign, including Angel Aguirre, the state governor of Guerrero. Following this logic, the official line is that the federal government is thus responding properly. Others, however, point fingers at all levels and branches of government. Conventional explanations tend to place the blame on overall ‘corruption’, quite evident in the outcries shared through social media hashtags such as #YaBasta, #YaMeCanse and #Ayotzinapa. Such explanations summarise the problem as an overabundance of corrupt politicians, corrupt policemen and corrupt military–in a nutshell, Mexico is ruled by corrupt individuals. Thus, whatever the administration of Peña Nieto is doing to address the student massacre is not considered sufficient to tackle corruption, the root cause of the problem. The crisis was further exacerbated by the news of a lavish property apparently acquired by the first lady through traffic of influence. 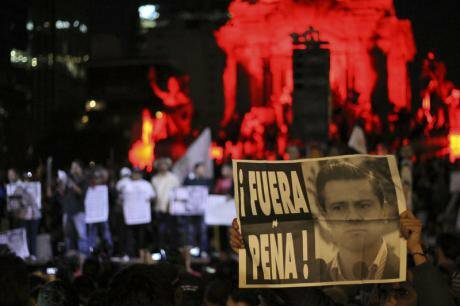 Some are calling on President Peña Nieto to resign. These arguments, however, are not as mutually exclusive as they are often presented, and to do so fails to adequately address the problem of accountability. On the one hand, those who see this as a local problem appear to be concerned only about criminal responsibility, looking at the problem from a criminal-law perspective. Based on this logic, as the administration has claimed, we cannot blame Peña Nieto for the disappearances, as he indeed did not personally kill the students. But this position fails to take into account of the socio-political context which made possible the emergence of such criminal behaviour. On the other hand, those who focus on the general problem of corruption are similarly oversimplifying. First, by blaming overall corruption we tend to distribute ‘guilt’ equally across politicians, state agents, criminals and even citizens: saying that everyone is to blame is equivalent to saying that no one is to blame. But the weakening of the rule of law in Mexico was only made possible by the failure of the federal government to keep order at all levels. With great power comes great responsibility, Voltaire once said. Thus, when assessing accountability, misbehaviour observed at the bottom mostly reflects poor observance by those at the summit of government, and blame should be distributed accordingly. Secondly, placing blame on corruption also neglects the context in which state actors are embedded. Among policy-makers and scholars corruption has long been defined as the abuse of power for personal gain. Such a definition however assumes a choice–an individual’s choice to engage in a corrupt act–and simplistic explanations fail to see this is hardly free. Ranking and power in public office matter significantly in shaping choice. My research in Mexico and Guatemala, along with that of scholars and activists working on gang violence and drug trafficking, has shown that in contexts where such violence prevails, individuals are only left with three options: join, be killed or go into exile. Thus, many are left virtually without choices. These two perspectives, fine-grained and panoramic, are actually two faces of the same coin. We can only understand the local problem of violent crime in Mexican towns and cities if we understand the emergence of the general problem of impunity and corruption. And when considered in tandem, it is the federal government of Mexico which bears the largest share of responsibility, for three reasons. First, we cannot simplify the current crisis as an isolated local event–impunity has fueled this type of behavior. The disappearance of the students was possible only in a context in which those involved knew they could get away with this crime. They were not doing something different; they were engaging in business as usual. Secondly, and relatedly, we also cannot reduce impunity to corruption. A policeman, a judge, a prosecutor, a foot soldier or even a town’s mayor, who are threatened with death if they do not comply with certain demands, are not given the ‘choice’ to participate in criminal activities. There is not space here to name all those law-abiding state agents who have been killed (along with their families in some cases) because they were unwilling to co-operate with organised crime. As a public prosecutor from the state of Chihuahua once told me, “we too have families to care for and we are not heroes”. Some state agents feel as defenceless as the common citizen. This is not to say that those state agents who shot, killed and burned the bodies of the students should not be deemed individually responsible for committing crimes, but if we want to understand the crisis in Mexico we need a perspective of democratic accountability. We need to ask the tough questions: how institutions have failed and why in Mexico state agents are not given the choice to do their jobs in compliance with the law. Thirdly, and most importantly, it is ultimately the duty of the Mexican state, whose power is concentrated in the federal government, to engender the conditions for human rights to be respected. Mexico has signed and ratified various human rights treaties, including the Universal Declaration of Human Rights. Furthermore, in 2011 a constitutional reform strengthened the state’s commitment to international human rights law, establishing the supremacy of treaties in domestic law. Although it is the duty of state agents, as civil servants, to protect individual rights, it is also the duty of the federal government to establish the conditions in which this is possible. What we see today in Mexico is not a ‘security’ crisis or even a ‘social’ crisis–but a human rights crisis, where the right to life, liberty and personal security, as well as the right to remedy by a competent tribunal among many others, are not protected by the state. Yes, President Peña Nieto, you as head of state and government are responsible for failing to instal the conditions in which the life of every individual within Mexican territory can be protected from harm, and for failing to support local and state institutions in offering remedies to victims when their rights have been violated. Yes, individual criminal accountability should be pursued against state agents and organised crime members for their criminal behaviour. But, ultimately, the federal government needs to be held accountable for what is happening in Mexico.